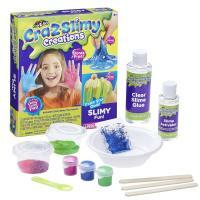 The Cra Z slimy - slimy fun kit includes everything you need to make your very own slime! Experiment with neon and glitter slime. Mix and match or keep it simple - its up to you! make it your way! its ooey gooey stretchy fun! 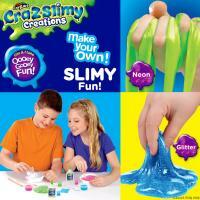 Make your very own slime! 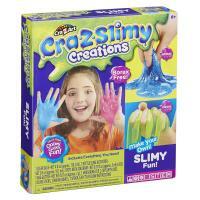 The kit includes everything you need to create slimy fun! Experiment with neon and glitter slime Mix and match or keep it simple - its up to you! Its Ooey gooey stretchy fun! Includes: 1 Clear Glue - 118 ml, 1 Bottle Slime Activator - 59 ml, 3 Pots Neon Colourant - 5 ml each, 1 Bag Glitter - 2g, 1 Measuring Cup, 2 Cups with Lids, 2 Mixing Bowls, 3 Slime Sticks, 1 Spoon and Easy-To-Follow Instructions.